Six new villages will be covered as part of FAR’s Breaking the Cycle of Poverty Program (BCPP), which recently began its fourth year of helping communities in Tavush Province’s Berd Region. One hundred and five families from the villages of Movses, Verin Karmiraghbyur, Choratan, Norashen, Navur and Itsaqar were chosen to receive support, which will include the creation of individual family stabilization plans by our social workers that will enable each family to access what they need to pull themselves out of poverty, including vocational skills development, medical care, educational opportunities and financial support, among other things. One key component of BCPP support to families is parental skills training, and this was one of the very first activities held in the new villages. These meetings are typically accompanied by talks on spiritual topics led by a priest. 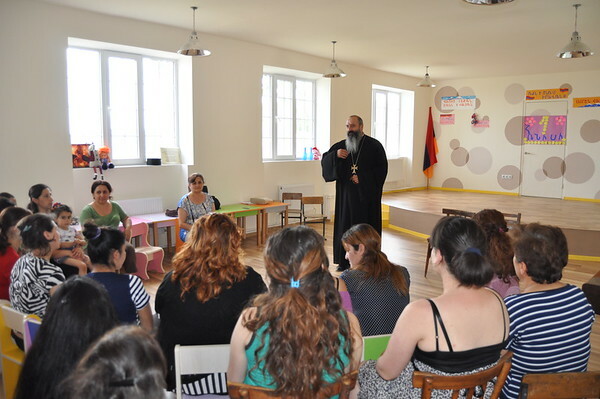 Meetings were recently held in Choratan and Navur villages where Father Abel Qartashyan discussed how to deal with internal family issues, parenting, and parent-child relationships with BCPP beneficiary families. “Participants were very active. They asked many questions that concerned them, and brought forward many personal examples that launched some very useful discussions. Many even asked us to organize more trainings like this,” said Lusine Grigoryan, FAR’s Berd Office manager.